Welcome to paradise….195 Winston is located in Inlet Beach, Florida, just steps away from the magnificent waters of the Gulf of Mexico. The professional decor offers a tasteful and classic feel making it the perfect beach home. Here you will find the perfect combination of luxury, comfort, and charm all wrapped into one. Upon entering, you will see a common living area with tile floors, flanked with bunk rooms on each side, each with its own full bath. Both rooms have a double set of bunk beds - one room with twin over twin, and the other with twin over queen. This is the perfect spot to let the kids, tweens, or teens have a space to call their own. As you move to the second floor, you will appreciate the beautiful pine floors. On this level of the home, you will find yourself gathered together with friends and loved ones creating memories of a lifetime while enjoying meals, game night, and movies. This inviting, open living area is large and spacious, while still maintaining that cozy, warm feel. This space contains a kitchen, living, and dining area all in one. There is plenty of room for cooking and enjoying meals casually at the L-shaped bar that seats six or at the dining room table with ample seating. After dinner, enjoy a family movie on the flat screen TV or catch up on that book you’ve been wanting to read over in the quaint seating area located a few feet away. Walk out on the balcony to enjoy those famous gulf views and breezes. Also on this level, there is a half bath and one king master. You will find it easy to pamper yourself in the impressive bathroom with granite countertops, double vanity, tiled walk in shower and tub. The laundry room is conveniently located on this floor as well.The magic continues as you ascend to the third floor. Here you will find two masters with king-sized beds, each with their own en suite bath. Each of the private balconies offers a more quiet, intimate setting for an evening nightcap. With the easy, Inlet Beach access less than fifty steps away, you can bask in the sand and sun and then return home to your very own piece of paradise. You will also enjoy access to the lovely Barbery Community Pool located just a short distance away. Nearby Rosemary, Seacrest, and Alys Beaches offer an array of casual and fine dining, all just a short walk or bike ride away. The search for your next vacation stops here…. 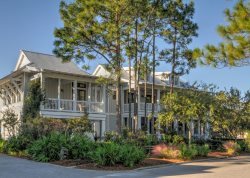 195 Winston is the pinnacle of beach homes in the 30A area.